Welcome to DSARAN.com. The Congregation of the Daughters of St. Anne (DSA), Ranchi is the local Congregation, founded by Mother Mary Bernadette Prasad Kispotta in July 26, 1897 along with three companions namely Mother Cecilia, Mother Veronica and Mother Mary. 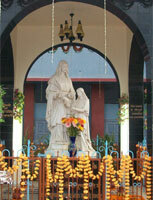 The Religious Congregation "The Daughter of St. Anne" had its origin in the sacred soil of Chotanagpur. It was erected at Ranchi on July 26th 1897 by Archbishop Paul Goethals in answer to the situation and needs of the contemporary local church.